Background: As part of the Education and Social Justice Project, in July 2017 undergraduate student Anastasia Sendoun interviewed Fr. Yuriy Kozlovsky, a priest and professor of philosophy at Ukrainian Catholic University. 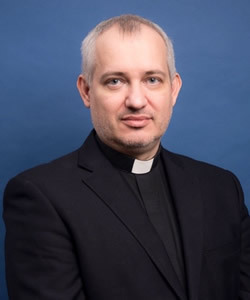 In this interview, he discusses the Ukrainian system of higher education and the role Ukrainian Catholic University plays in shaping that system. Kozlovsky notes his pride in the school's commitment to providing a high-quality education while rejecting corruption. My name is Father Yuriy Kozlovsky. I am a priest and a professor of several philosophical subjects. I specialized in philosophy at the Ivano-Frankivsk Spiritual Seminary, but the last four years, I have been working at the Ukrainian Catholic University as the director of the Collegium, the university’s residential building, and I lead the Office of Student Life. In a way, it is difficult for me to answer the question because I have never actually studied in Ukraine. At 15 years old, I went to Rome to study at the seminary. This was in 1992, when the Soviet Union had only just collapsed and seminaries in Ukraine were only just being founded. I was in Rome studying for 12 years, and when I returned, I returned to work. I never studied in Ukraine, but I always worked in academic settings. If there is any one thing that can change our nation, that can change Ukraine, it is an educated and enlightened youth. We will soon be celebrating 27 years of Ukrainian independence. Clearly, if we are looking at some situations—whether in politics or economics or in social life, in questions of community life, or in education, whatever it may be—if we see errors in that system, this is probably because new people have not yet gone into that environment and the old, conservative mentality still reigns. Conservative, not in the sense of healthy conservatism, but Soviet conservatism, the old socialist outlook on organization of education or life under government influence which limits rather than develops. In my opinion, the absence of enlightenment, amongst youth especially, is the cause of a number of problems. All the positive shifts forward that have occurred since Ukraine gained independence occurred because of young people who did not want to live according to the old system. Education always played a particularly important role in terms of changing the mentality of young people. Whether the revolution of 2004 or the revolution at the Maidan in 2014 or the fall of the Soviet Union at the beginning of the 1990s, the truly significant steps forward happened thanks to young people. And particularly, the youth at university who were open to accepting new things, who were open to learning. If we want to have a society that is growing, that is developing and coming out of the post-Soviet, post-socialist limitations, it is absolutely crucial for every one individual to have a sense of the value of education. Even today in Ukraine, I believe that half of the Ukrainian population has never left the region in which they grew up—probably because of their economic situation or visa restrictions, or even a mental closedness from Soviet times. Many people have never been in the West, and this too is education, to see how others live, how it is possible to live. It was difficult to move my family to Lviv, but I thought it was a necessary step for my children because I want my children to live in the kind of academic environment that exists at the Ukrainian Catholic University (UCU). That is, progressive, oriented towards objective values (as much religious as societal), and free. UCU is free from government interference, since it does not receive funds from the government, which allows us, as a university, to do things the way we see fit. I want my children to grow up in this sort of environment. How many young people who desire to access higher education in Ukraine have the opportunity to do so? It seems to me that in Ukraine there is free access to higher education in terms of numbers. That is, most individuals are able to enroll in a university and study. This was part of the Soviet system of education—that everyone could study, that there was free, universal education for everyone. The downside of such a system is that there is lowering of educational standards. Higher education stops being something particular and becomes something common in a disadvantageous way. This is because it generates professionals of low quality—that is, low-quality engineers, low-quality doctors, low-quality journalists. Universities in Ukraine often have to concern themselves with questions of quantity of students studying rather than the quality of the education because quantity is what determines how much money that university gets from the government. Quality doesn’t earn anything. UCU is tiny—we only have 1,300 to 1,400 full-time students. Because we are able to concern ourselves with the quality of education and not the quantity of students, we are truly very different when compared with other Ukrainian universities. Everyone knows about us, despite the fact that we are so small. Students pay tuition, but 80 percent of tuition costs are paid for by benefactors. This allows us to be independent and to care about quality. The amount we spend on every student is far from what public universities can permit themselves to spend. The system of higher education in Ukraine has made higher education accessible, but it has also made it of very low quality. This is the biggest challenge for our educational system—to think of models of development that can stimulate the quality of education. In the Soviet Union, there was this saying: “Education puts bread in the hands of people.” That is to say, education is meant to provide the knowledge by which an individual can earn enough to survive. However, education should be more than just providing people with a job and a minimum wage. It must reveal something eternal; it must reveal the truth. Many people say that justice is equality. I, however, do not agree with this definition because not all equality is good. For those of us who grew up in the Soviet Union, the question of social justice and social injustice was a tricky question. Social injustice, for those who grew up under the Soviet regime, is our history. My family lost everything they had—not just their physical possessions, but their rights to religious freedom and freedom of speech. These histories have shaped the concept of social justice in Ukraine because for the longest time, we heard the language of equality but lived the opposite. These wounds are incredibly fresh and incredibly painful still. During the EuroMaidan protests, the students would often say that we, as a society, deserve better from our government. We deserve better. This phrase illustrates that there is still a great deal of injustice in society. What is the role of religion in Ukrainian political and social life? Officially, religion is separated from political life. However, Ukrainians in general are very religious. The level of religious consciousness is very high in Ukraine. This means that politicians sometimes try to take advantage of people’s religiosity and when they want to improve their image, they donate money to the church. Amongst the institutions in Ukraine, the church has some of the highest levels of public trust. Under the Soviet Union, the church was persecuted and was forced to the margins of social life. The church today must play a bigger role in education. How do you envision the future of Ukraine and what role do you think UCU will play in that future? It is almost impossible to predict because even in the last three years, things that no one could have predicted have occurred. The loss of Crimea, the conflict in the east, the weakness of the government—even a month before they happened, nobody foresaw them. Because of this, I am hesitant to predict what the future will be like. Given the events of the Maidan, Ukraine is oriented toward the West, toward Europe. Because of this, our history for the next 20 to 30 years will be very dependent on European processes. UCU has always been in the avant-garde of social institutions. Our graduates are still very young because the university was only founded 13 years ago, and many of our programs are only a few years old. It is still early for our graduates to have an influence on society broadly. But we have been able to impact the educational environment. For example, in that we have categorically rejected any form of corruption, which in other institutions of higher learning is accepted. Just four years ago, we had only 600 students. When we were first starting, we only had 200. Despite only having 200 students, the fact that we rejected all corruption made us unique and made us attractive. It made us competitive with universities that had thousands of students. I hope that the university sticks to its foundational values, which include religious, spiritual, and socially just principles. Our financial model is transparent—anyone can see our income and how we spend our money. We pay our taxes. Anyone who knows Ukraine knows that it is very difficult to be honest in Ukraine. I am proud that our university is honest. I hope that our university maintains this sense of innovation, progressivism, and honesty. This is the role I hope our university plays in society.